Gov. Aminu Masari of Katsina State has described the recent defection of former Vice President Atiku Abubakar as an exercise in futility. Masari made the statement in an interview with the News Agency of Nigeria NAN in Maiadua, Katsina State on Monday. He said the defection of the vice president would not in anyway affect the electoral success of the ruling APC, stressing Atiku had just answered his popular name. He said the APC was aimed at repositioning the nation by creating leaders that would champion the positive cause of the nation; “about 65 per cent of our political appointments were allocated to the youth”. 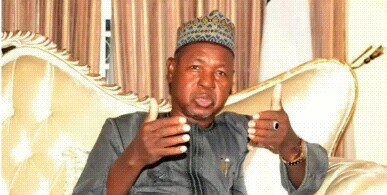 Masari said the era of “do or die politics was over as individual character and his performance speak for him in a political warfare, not unnecessary pride and display of wealth”. He said APC in the state and federal levels would not be deterred by elitist tendencies, adding that “we are set to receive more defectors into the party by next year as many influential members of the opposition would be joining us soon”. He said the party was willing and ready to accept and accommodate any individual who sought to defect into its fold, stressing politics was a game of number. He said his administration had, in the last two years, constructed many roads, schools, hospitals and intensified efforts on security in the state.